She puts her cup down too hard, and the coffee inside gathers up and spits onto the tabletop. He rips a paper towel from the roll, hands it to her, and sits back down. His interlaced fingers form a knot. As he stares into the hole created by his thumbs and index fingers, she continues to speak, and he half-listens. He’s heard the gist—cheer up, damn you—and sympathizes, though he struggles to comply. He’d like to save himself as she wishes but pretends instead. The birds are already up, and cool, damp air seeps in from the open window. It will be another warm day, bearable in the morning—pleasant even—but still and heavy with sun by mid-afternoon. The summer he was ten, he spent days like this with neighborhood boys. They collected personnel for baseball games at the backstop down the street or played capture-the-flag or hide-and-seek. They played like soldiers, occupying maps larger than their block. Sometimes, he hid among honeysuckles—though he knew he’d be found there—just to linger in the shadow and scent. If someone begged a ride, they’d go to the pool, and he’d return home in late afternoon cool, clean, and sated by sun. After TV, after supper, after another hour of play on the block, after more TV, after a few pages of a boys’ book, he slept. Memory is dangerous. It makes one perfect summer day into a condition, what “would” happen every day. Then it rewrites the past altogether. He tells these stories so often their gilded nostalgia wears thin and reveals gray metal beneath. These tales were once solace, but he over-handles them, relying on bright imagination that never quite saves him. She’s right to expect more. Because she loves him and he loves her, he tries and, for long stretches, rouses himself to cut vegetables, do the dishes, change the light bulb burned out upstairs, make and follow through on intentions. It’s all intention. He wants to believe in fresh pleasures and new stories but soon leaves cabinets open and forgets to set the timer for the potatoes. He crawls in bed early, unable to do one more thing, though he’s done much less than planned. He awakes to familiar rituals and gestures. In school he learned about entropy, the heat death of the universe. Mr. Clements spread spaghetti-thin arms and said, “Everything will average. Hot will cool and cool will heat up. The whole universe will level out.” Sitting in the third row—as he did in every class—he pictured the universe as one bucket of tepid water. Mr. Clements sat back down beside the overhead projector and rolled the notes forward. “Copy these,” he said. His eyes dropped to the page again. She must be exhausted with restarting. A heavy sled without dogs, he dreams of hitting a frictionless patch with favorable gravity, a place motion will take. He wants to redeem her hope. He’s not sure what hope is. He was ambitious once. In high school, he wrote his 400 meter times on a pad in his locker, noting each tenth gained as he approached the school record. He squeezed like a spring into the blocks and, at the gun, became pure will. And he smiles. Some days, the only kindness he marshals is playing this role. The birds chatter, and today’s humidity gathers in the kitchen. He loves this time of day and wants it to pass. He remembers joy and settles on survival. He takes a deep breath of morning air and sighs. Nearly every address begins with some variation on that statement, and, often, speakers joke what a dubious honor—slash—anxious burden the invitation is. However, given my late-May exhaustion, it’d likely be the last sidestepping I’d do. I might remind graduates to double-space their papers and put the punctuation inside the quotation marks. I might threaten them with another year of high school if they can’t recite, “’I’ before ‘e’ except after ‘c’” and seven exceptions. Though teachers stand in front of classes every day, opportunities for uninterrupted public commentary are rare. 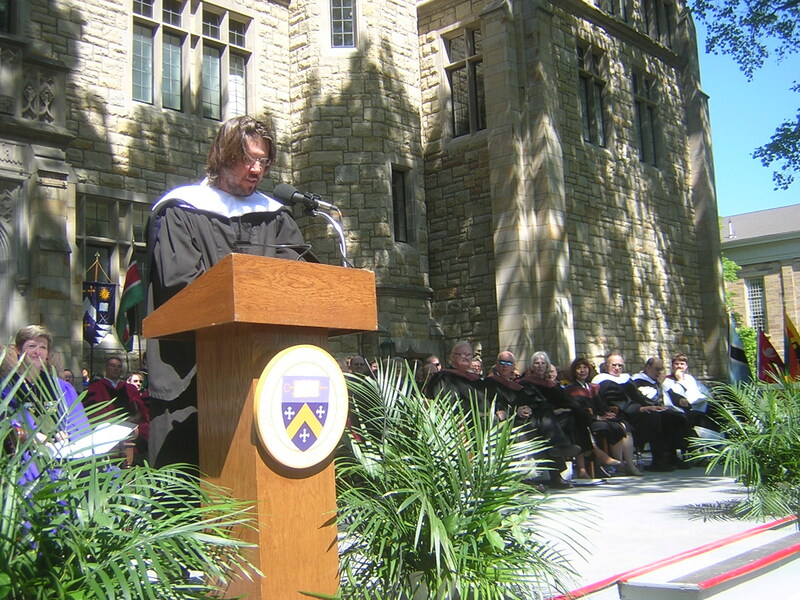 It makes news when graduation speakers succumb to the temptation to critique the current generation, but I understand. One sign of love, after all, is sincerity. Students should want honesty. They’re a captive audience—what better time to say, “Yes, you’re wonderful, but…”? When I was a young parent, I attended a number of junior versions of graduation with kindergarteners or lower schoolers or camp attendees or participants in a rainbow of other activities. These graduation parodies are cute—like making a dog wear a snood and sunglasses. Yet, sometimes, so are our solemn and serious commencements. The elevation of the occasion insists on congratulatory platitudes and sugared inspiration, and graduation slips into bombast or, worse, announces its artifice by stepping gingerly around realities. Three times I’ve stood at that podium and said something less than I might have. I could have offered subtler, more insightful advice, confessed more doubt, and grappled more vigorously with the troublesome inevitability of disappointment. Graduates, it’s an honor to speak today. Thank you… I mean it. I’m humbled standing here, overwhelmed by your faith I have a valuable message to impart. I’m not so sure, however, and this address will be shorter than you imagined. It requires attention perhaps impossible on such an exciting day. Nonetheless, here I go. You should be proud of the accomplishment we’re celebrating today… but don’t be too proud. Ambition and personal progress aren’t everything. Watching you these four years has inspired hope… but also frustration. Sometimes I worry you don’t see this beautiful world as clearly as you should, and that, if you don’t lift your eyes from screens and start looking soon, you may spend a lifetime wandering among the clutter of possessions, degrees, school names, and job titles you laud as life’s treasure. I worry you may look up from amusements and discover the world spoiled… or gone. I’ve heard you use the expression “Being real.” In our time, nothing is harder. I’ve lost my way enough to believe landmarks proffered by society are unreliable. Marketers advertise days like this as milestones when, really, your ordinary hours count more. With every petty triumph and mishap you fashion the internal compass to guide you. You are your habits. My colleagues and I have such deep hopes for you. You may have cursed us at times, but our affection explains why we’ve asked so much of you. We wanted to teach you to think, and some of you have learned well. Others act the part, swinging between doing what looks good and what’s sincere and earnest. That’s okay. I act too. We have to sometimes, and, in dark moments, everyone wonders what’s real and true. Everything real and meaningful to me started with asking, “What matters?” I’ve occasionally wanted to hand you the list I’ve compiled, but you will create your own. I request just one more thing before you leave. Make your list deliberately and thoughtfully and with the highest purpose. The world doesn’t need more lazy opinion, more pretense, more snarky irony, more secret contempt, more misanthropy, more hollow love or name-only friendship. It doesn’t need more aloofness, more consumption for consumption’s sake, more self-absorption or self-congratulation. It needs us awake and alive, grateful and caring, modest and sensitive. It needs real attention, affection, and aspiration. Graduates, what’s ahead isn’t easy, but, if you lift your head and open your eyes, I promise life will be more glorious than you can imagine even on this, a most glorious day. I know one of our graduates really well—my daughter. I’m sure she’s happy I won’t be troubling her class with my worries. And I’m happy to leave the day to her… generally. I feel only the slightest twinge of regret, the usual fed-up end-of-the-year urge to issue one last challenge. Yearly, we teachers hear the “Digital Natives” in our classrooms need something more and different. New technologies, programs, and applications will improve our instruction, we’re told, and each fall the push begins to integrate new methods into our classes. The old ways have passed away, and the message is clear: keep up or risk irrelevance and invisibility. Resisting progress is announcing your mental arthritis, your denial of newer realities. I do the best I can but have an ugly confession: I love the throw-backs, the students who don’t need the enticement and excitement of innovative technology or techniques, who rely instead on their own inquisitiveness and the computers they carry within them. They appreciate learning whether it’s technologically advanced or not. Everything new is old again, and vice versa. A teacher’s biggest challenge is convincing students to care—in my case, to value books increasingly regarded as passé, dull, or irrelevant; to embrace reading accurately, thoughtfully, and discerningly; to accept the useful torture of writing; to enjoy rumination that questions (even undermines) original answers. You have to want hard work to do it well, and, while easier paths lead to quicker results, they often sidestep the labor that improves you. Some students flog themselves through school because they see it as a means to status or professional success, but most need intrinsic motives, curiosity, a feeling labor rewards itself. Technology is supposed to motivate and sometimes does, but the students who want to learn hear real people speaking from every and any source. Those who don’t wish to listen regard all words, electronic or ink, as noise interrupting what they’d rather be doing. My job is to assert authors’ voices are valuable. Insisting may not be enough, but elaborate, stimulating, and entertaining technology often does little better and distracts students as much as it entices them. They grow rare, these students who accept low-tech education, who look past apparatus to the stuff of learning. My eyes sting with tears when I meet a student who expects struggle and wants it, who loves the frustrating play of writing, who smiles encountering the delicate expression of deep truth, who occupies a character’s mind with his or her own, who hears ancient ideas echoing in the present, who leaps like a spark between unlikely poles, who tunnels like a blind mole immune to diversion, who finds splendor in faintly etched messages, who laughs, or cries, or angers, or warms, or cools, or gasps when encountering another mind. Of course, all these traits exist in technophiles too, but does technology assure sound scholarship, does it guarantee interest? When I started teaching, I poked the ground with a straw and oil bubbled out. Perhaps that had more to do with youthful enthusiasm, but every effort produced more than enough response to sustain me. I don’t begrudge the effort of preparing lessons or dreaming up new and different ways to engage students. I like my students. But lately the ground appears to yield less. The proportion of effort to return has changed. For my students, life outside school is so much more exciting than anything I can serve up. Students race ahead. Keeping up seems more and more taxing, the gained learning less and less fulfilling. Style trumps substance. Perhaps I’ve become the teacher who has passed the age of being cool and, now older than his students’ parents, is part of the place, another desk or chair. I’d rather not be. Who wants to be the person colleagues regard deferentially, the one whose antique experience inspires the sort of love generally reserved for decaying uncles? Who wants to be the genial holdover whose eccentricities must be borne? I want to be hip. But I’m tired and wonder how the latest novelty will help. So, the story goes a talent agent spotted film actress Lana Turner when she ditched a typing class for a coke at Schwab’s Drug Store in Hollywood. It was really the Top Hat Café, but the name of the place matters little. She was nothing and, in less than a moment, something. In another decade or two, few people will remember Lana Turner, much less the roller-coaster life she led from that point on, but other stories will certainly supplant hers. American mythology swims in discovery stories. The slightest eventuality can make us—the friction between one numbered ping-pong ball and another, a brother-in-law who has a cousin who has a friend who has a cousin who has a brother-in-law who has an idea, the unaccountable impulse to shine a flashlight into the darkest corner of an attic just when you decide it’s too hot to stay, the bizarre eventuality that puts you in the seat next to a famous power broker in an unusually receptive mood. The best American success stories involve work only incidentally, just twirling tumblers of a safe until it softly and inevitably clicks open. If the door of opportunity swings for a minute, an hour, a year, or forever, nothing can surpass that instant when you are free for life. That miracle. At my age, the door of discovery seems welded, and I’ve never had the gumption for the savvy networking and clever positioning that lands people in just the right places when attention sweeps their way. Yet, as no effective solution prevents dreaming, I’m susceptible. My modest successes as a teacher, writer, and artist ought to be enough (and mostly are), but I still imagine being found. The obvious answer, for me and for my students, is “Yes.” The fantasy of discovery begins with the world recognizing how deserving you have always been. For once in your miserable life, others will see you just as you wish to see yourself and marvel at how you’ve gone unnoticed so long. At this stage I tell myself that my being discovered might be more like finding a sock under the washing machine when it’s replaced. As surprising as it might be—a mystery solved!—it’s rather academic. I abandoned the sock’s mate long ago, the mourning period passed long ago. The dream of fame, status, and repute as an instantaneous serendipitous confluence of fateful events suits younger people better. I wish my little measure of acceptance was enough, but when others experience success—as they inevitably will—believing in your own deserving seems so much easier than believing in theirs. Hope, the feeling Emily Dickinson called “The thing with feathers,” still wants to fly, and against the stiffest winter wind. The little voice saying “Why not me?” never really quiets. Maybe. More welcome, however, would be feeling you have success enough. These stories may be the sole means to make discontent tolerable or the greatest source of discontent. I’m not sure. But waking up one morning accepting my own worth—feeling it’s real without ratification or verification—could be the greatest discovery of all.